Virtualization offers the potential for impressive operational cost improvements and enhanced service agility. Virtualized servers, storage, networks, and even entire data centers means the abstraction of all things hardware is underway within the enterprise. The downside? Concentrating efforts on asset utilization and efficiency improvements with virtualization can lead to increased workloads and monitoring blind spots. The result is infrastructure conflicts that stress the IT resources and negatively impact end-user experience. The challenge for service delivery teams whether server, network, or infrastructure lies in knowing the health of virtualized operations. This means understanding the performance status of all virtualized components, their underlying host health, and if relevant the applications that run on them. To overcome the challenges of virtualization, you need to see into virtual assets with the same comprehensive visibility and clarity as non-virtualized environments. The Observer Performance Management Platform gives teams complete gigabit Ethernet, 10G, and 40G visibility on high capacity access layer links to and from the virtualized servers. See east-west traffic between hosts, hypervisor, and VMs, and north-south conversations from the core to the network edge. 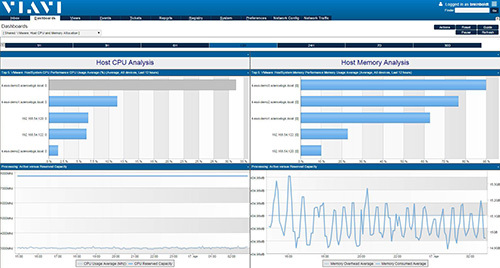 Get deep server and network virtual component awareness and powerful application monitoring capabilities for rapid troubleshooting, resolution, and optimal performance. Gain in-depth intelligence into underlying health via advanced polling integrating the data with packet level details. From the user to the host and everything in-between, manage with comprehension and insight.